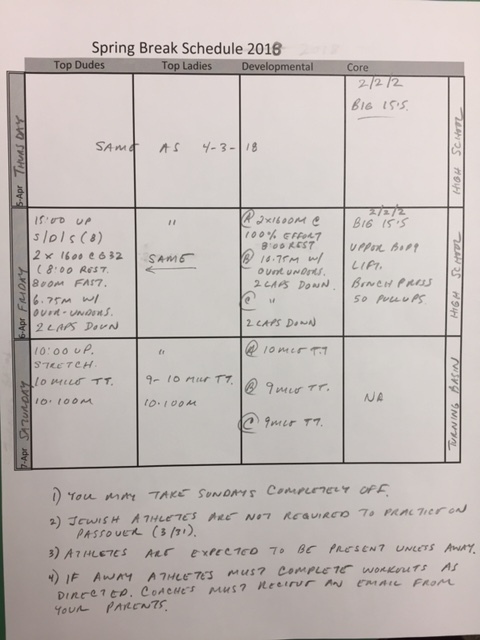 4/3/2018 10m jog, Stretch, drills, strides (8) 350 fast – 3:30 rest- 300 fast- 3:00 rest, 250 fast- 2:30 rest- 200 fast- 2:00 rest, 150 fast 90s rest, 100 fast – 1 min rest, 50 fast, 2 laps cooldown Hang cleans (5 sets 5 reps) ab work 5×5 10 lbs. 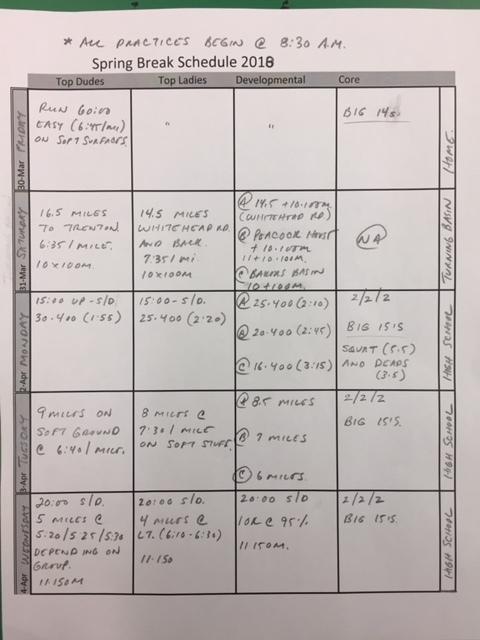 4/5/2018 10m jog, Stretch, drills, strides (8) 12 laps strides and straights. Ab work 5 sets 5 reps 15lbs. 4/7/2018 10m jog, Stretch, drills, strides (8) 3 x 300m at 100% of goal 400m, 12:00 rest, over unders between. Hurdlers 3 x last 8 hurdles @ 95% effort 10:00 rest between each. Squats / Deads. 5×5/ 3×5, ab work 5 sets 5 reps with 15 lbs. complete assignmnts on their own- parents must email (coachwayton@gmail.com) prior to leaving.